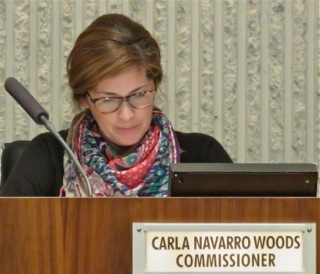 The Costa Mesa City Council meets again on Tuesday, March 7, 2017 for a meeting full of interesting stuff. The Closed Session - which will begin at 4:00 p.m. in City Council Chambers and will adjourn to Conference Room 5A immediately following Public Comments on those items, if any - has one lawsuit and four labor negotiation items on that agenda. The Regular meeting begins at 6:00 p.m. in City Council Chambers and has a load of interesting issues that will be heard. You can read the entire agenda report HERE. The Consent Calendar has seven (7) items on it. These, theoretically, should be able to be heard and voted upon in one vote without discussion. We'll see. 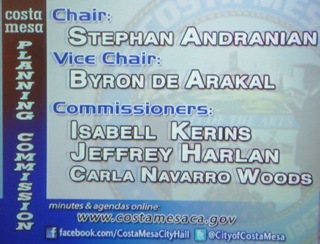 Public Hearing #1, HERE, is the second reading of the COIN hearing for the new Memorandum of Understanding between the City and the Costa Mesa City Employees Association (CMCEA). This establishes new pay rates, pension contribution rates and Health Insurance payments PLUS establishes two new positions - Fairview Park Adminstrator and the Confidential classification of Office Specialist II in the City Manager's office. There are twelve (12) attachments to the staff report, including eight (8) separate resolutions, the MOU, two position descriptions and the COIN Fiscal Impact Analysis. Great weekend reading for you all. Public Hearing #2, HERE, is the second biggie on the agenda. This includes the Financial Update Report, including 1) The 6/30/16 Consolidated Annual Financial Report (CAFR), 2) The Mid-Year Budget Report and 3) The Updated Five-Year Financial Plan. There are separate attachments for each of those items. The report addresses many financial issues, like the nearly $11 million budget surplus from last year and a list of items requested by the City Council at the recent Study Session on this subject. One question - will the City Council continue to provide City Manager Tom Hatch with a $1 million contingency (slush) fund? Take a few minutes on this one - more weekend reading for you. New Business #1, HERE, addresses three City Committees that required direction and solutions based on earlier council comments. The plan here is to keep this a five-member committee with two alternates, each serving 4 years. However, the staff report provides a new series of requirements for membership on this committee, which apparently will disqualify some of the previous members. Read the report. This is a brand new committee, replacing the previous Military Affairs Team - a loosely-configured group of hardworking volunteers. This new committee will have seven (7) members with staggered terms - 4 four-year terms and 3 two-year terms. The scope of this new committee is described in detail in the report. This merges the old Finance Advisory Committee with the Pension Oversight Committee and will consist of eleven (11) members serving staggered terms - 6 two-years and 5 one-year. According to the report, one of the voting members shall be the Mayor's designee, which might make for some interesting discussion, since the Mayor could appoint someone of like mind without council majority approval that would have tie-breaking capability - like the Vice President of the United States, who serves as the President of the Senate and is the 101st vote. The scope of responsibility of this committee seems quite comprehensive and makes me wonder whether this particular committee might not be better configured as a commission. Certainly, the financial issues with which it will deal seem much more in line with the responsibilities of the Planning Commission, for example. Anyhow, read the report and see if you agree. Assuming the City Council agrees with these plans and approves them Tuesday night, the plan is for City Clerk Brenda Green to launch a recruitment effort for each from March 8, 2017 to March 22, 2017. The staff will schedule the appointments to the committees for the regular City Council meeting of April 4, 2017. It's going to be a very interesting night. If you cannot attend, watch it live-streamed on the City Website or live on CMTV. 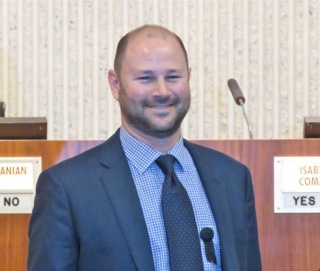 The Costa Mesa Planning Commission filled its roster Monday night when Jeffrey Harlan was sworn-in by City Clerk Brenda Green and took his place on the dais. It didn't take long for us to realize he was an excellent choice. 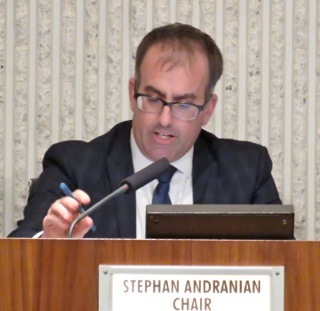 Richard Russell wondered why so few items appeared on the last couple of agendas and suggested that some kind of a report to the commission from staff listing the pending issues being handled by Planning now - an exercise in data collection the commissioners might find valuable. Cindy Brenneman criticized the selection process that produced Commissioner Woods on the dais and suggested it should not happen again. 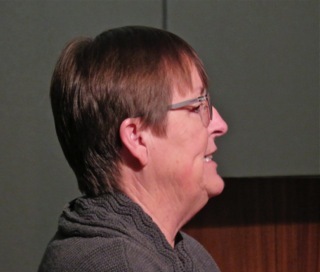 An unidentified woman wondered about the status of group homes in the city, then pointed out some new ones she had discovered. 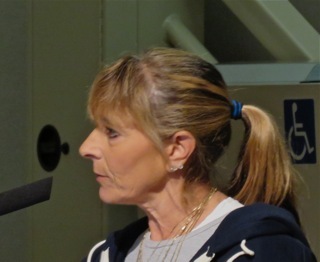 She also expressed concern about liquor being sold at the 99 cent store on Harbor Blvd. 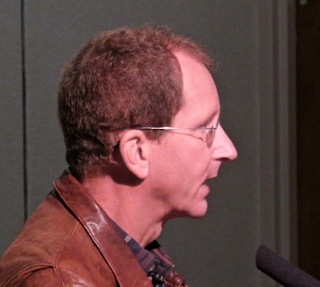 Barrie Fisher encouraged the commissioners to not lump all sober living facilities into one group - as bad operators. 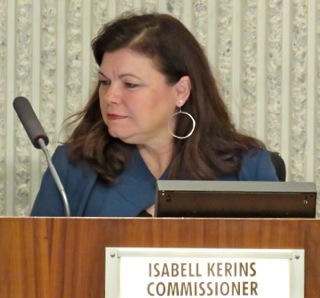 During Commissioner Comments Commissioners Isabell Kerins and Carla Woods had nothing to say. 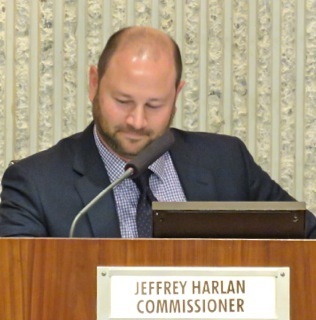 New Commissioner Harlan said he was honored to serve the community and looked forward to the future. 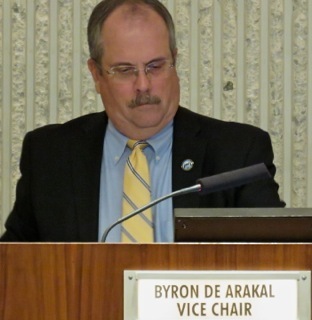 Commissioner Byron de Arakal asked Interim Development Services Director Jay Trevino for a status on the sober living issues, who responded that the City Council is "deliberating" about what to do about our ordinances, and that he thought we might see something within the next 45 days. He observed that there were a number of pending items in December and will report back on that next time. de Arakal also welcomed Harlan to the group. 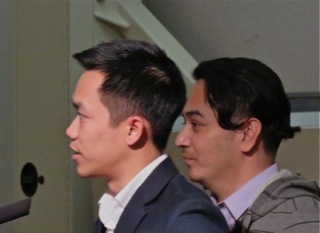 Chairman Stephan Andranian also welcomed Harlan and reinforced his interest in a report from Trevino on the sober living home status. he wondered about some kind of guidance from staff regarding continuances since this is the second meeting in a row when such an item appears before them. 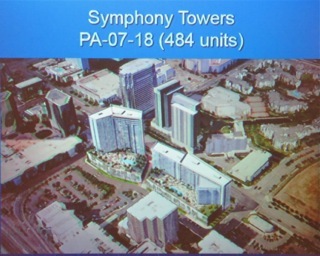 He also thought a report on Planning Department status could be interesting, suggesting a breakdown between Commercial and Residential projects would be good. He also wondered about a comparison to previous years. He told us that the ground-breaking ceremony for the new Fire Station #1 will be held on March 11th. 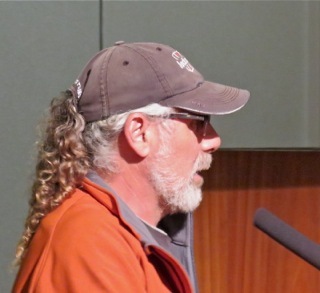 He then, responding to Brenneman's criticism, observed that the selection process for commissioners was not within the purview of the Planning Commission, and that such comments would be better directed there. The Consent Calendar - two sets of minutes of previous meetings - was handled without discussion and passed on a 5-0 vote. EXTENSION ON SAKIOKA DEVELOPMENT ON ANTON BLVD. 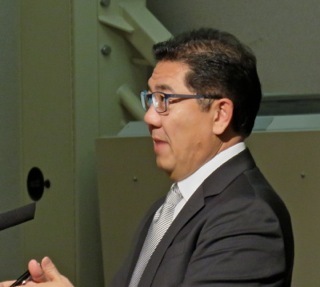 Next up was Public Hearing #1, the request for a one year continuance for 585 and 595 Anton Blvd - a project by landowner George Sakioka, who spoke to the issue and gave a brief history of the project and the reason for the one-year extension request. After a short discussion and one public commentor who urged the commission to be fair, the commission passed the request on a 5-0 vote. 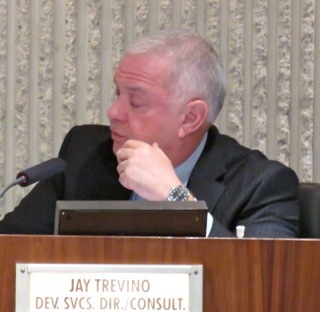 Before the adjournment Trevino reminded the commission of the joint meeting with the City Council and Planning Commission on March 28th to discuss the Lions Park development. The next meeting will be March 13th. The meeting was adjourned at 7:15 p.m. - a refreshing change. A couple thoughts... all the commissioners are getting their sea legs. All participated in the discussions and all had done their homework. There is enough diversity of background and education among them that I suspect we'll get some good, solid deliberations from this group as we move forward on some very controversial issues - sober living homes, small lot ordinance, Harbor Blvd and Newport Blvd. Overlays and more.